:[from Dr. Fisher's presentation] "I will remember to have an open mind when it comes to art and to remind my students to free their mind and erase whatever else is going on in their lives and just concentrate on what they are working on. Matrixial art is new to me but I really enjoyed learning about it...". 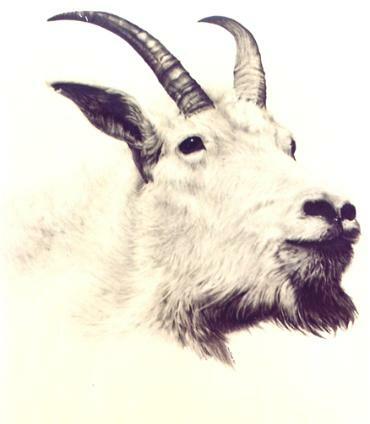 This pencil portrait (1975) I did, is an example of drawing from early in my career in which I worked to bring life and soul into the subject and composition. Playing with the light and dark contrasting shapes fascinated me more than drawing a mtn. goat. I also learned over the decades that representational art gets boring after awhile. Most matured artists who are really growing will move into more abstract and imaginative spontaneous art (see Art Gallery). 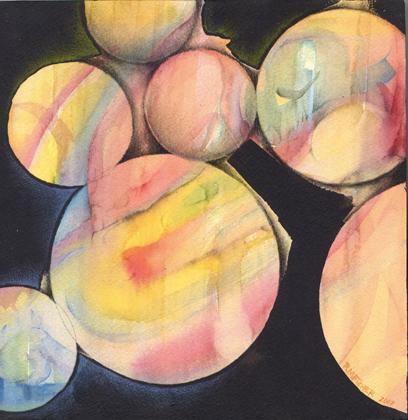 The watercolor and colored pencil medium goes well together to create, for example spheres (2004). It is an example of the art I like doing now and like to teach people how to use colored pencils especially as an easy and non-messy instrument to learn. Again, how much life and breath is important even in abstract works of art. I've created a method called "matrixial drawing/coloring" which I'll teach to individuals in sessions and groups (see free self-guide brochure to matrixial aesthetics and art below). As well you may consider me to come and talk to your group about art, about my art, and/or to critique their art progress. I like judging group art shows as well. My FEE for art teaching individuals is generally $60/hr (US dollars), with exceptions made in unique cases, so give me a call to talk about options. Group rate, depending on how many individuals, would be closer to $200/hr. A day long 6 hr workshop $800. 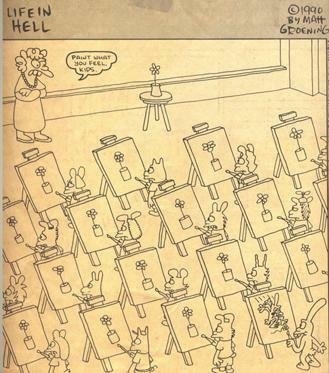 The cartoon to the left pretty much sums up my concern with how art is often conceived by society, principals, other subject teachers, and many parents. I'm the one in the cartoon at the lower right corner doing something "different." I could have easily became an art teacher, upon reflection, but I was too much of an artist to do so. "You are not copying nature, but responding to nature in full awareness, to the way nature expresses itself in that object." For Franck, and myself as an art teacher (my speciality being drawing/painting), the challenging task is to guide students to learn how to see differently than the way they do, to see more deeply and sensitively in/with the environment and objects, and processes of life, without imposing "memory" in their art so much, and without imposing overly conceptual ideas and stereotypes of things, but to really see things and/or imagine in full awareness their relationship to each other and to you the artist-maker, expressing them uniquely each time they are drawn or painted. I teach students how to make their art work "breathe" and from that point forward, "beauty" will arrive on the scene, sooner or later. And yes, practice practice practice helps. I call it "matrixial art" or "fusion drawing/coloring." I have been studying aesthetic development for nearly 30 yrs. and now I have specific ideas to share in art practices to correct biases in our aesthetic training that has largely been unconscious.